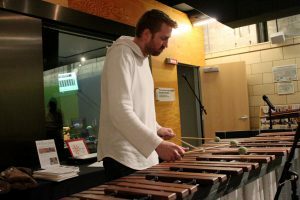 From 12/16/2017: Live music with the unique sounds of Handmade Percussion featuring percussionist extraordinaire Colin Pinto-Martin. Bravo Colin. Wonderful to hear what you’re doing for the local music community in Pittsburgh. As someone who had the priviledge of building one of these instruments along side him, I can only attest to the quality and integrity that Colin carries with him in all aspects of the craft. Sending love from Oberlin. Thanks for everything.